To improve yield and nutrient absorption, the addition of fertilizers to provide nutrients in adequate quantities is recommended. An alternative substitution for soluble fertilizer is the use of Acidithiobacillus bacteria to produce rock biofertilizer that is then mixed with organic matter inoculated with diazotrophic bacteria (Beijerinckia indica) for N enrichment. This study evaluates the effectiveness of biofertilizer on nutrient uptake and its interaction with sugarcane filter cake in field-grown sugarcane on an Ultisol in the Brazilian rainforest region. The experiment used two NPK fertilizer treatments (biofertilizer and soluble fertilizer) applied at three rates (50, 100 and 150% of the recommended rate [RR]) and a control treatment of earthworm compost (20 t ha-1). The fertilizer treatments were applied with and without filter cake, in four replicates. Total C and N, available P and K, and exchangeable Ca and Mg in plants (upper shoots, leaves and stems) as well as soil samples were analyzed. The biofertilizer showed similar responses as did the soluble fertilizer in nutrient uptake in the different parts of sugarcane and in the soil samples. The effects of biofertilizer were enhanced by the interaction of the fertilizer treatments with sugarcane filter cake. We concluded that the biofertilizer enriched in N by inoculation with B. indica may be a viable alternative for the replacement of soluble fertilizers in sugarcane. Brazil is currently the largest sugarcane producer in the world (Stamford et al., 2016), with production estimated to be more than 750 million tons. The total crop area in Pernambuco state is approximately 300,000 ha but presents low productivity, equal to 50 t ha-1. To increase sugarcane yield, the application of soluble fertilizers is the most used agricultural practice. The production of soluble fertilizers however, has a considerable cost, consumes a substantial amount of energy and may lead to environmental problems due to the leaching of soluble nutrients into deeper soil layers (Stamford et al., 2014). In Brazil the importance of filter cake results not only from the large volume generated (30 to 40 kg per tonne of ground cane), but also from the considerable percentage of organic matter and essential elements to the plants and can replace, even partially, fertilizers (Santos et al., 2011a; Vazquez et al., 2015). The filter cake, is formed by a mixture of bagasse and decanting sludge, has chemistry composition variable, depending on the type of soil, variety and maturation of the sugarcane, process of clarification of the broth and others (Almeida Júnior et al., 2011) presenting high levels of organic matter, phosphorus and calcium. The nutrients present in the filter cake are organic, and its release, occurs gradually by mineralization and by microorganisms activity in the soil and the utilization by plants (Rossetto et al., 2008). For this reason, it is necessary to know the composition of this material, which contains on average: 14.5 kg of Nitrogen; 11.1 kg P2O5; 7.0 kg of K2O; 52.5 kg of CaO and 5.2 kg of MgO (Koffler and Donzelli, 1987). Tropical soils generally contain low available P and K nutrient for plants. Therefore, the application of renewable sources of natural products is necessary for the rational use of fertilizers in agriculture and specifically to minimize environmental problems (Roesch et al. 2005, Oliveira et al., 2016). There are great possibilities for using phosphate and potassic rocks to produce biofertilizers and these possibilities involve practical processes that reduce energy consumption and promote the increasing availability of nutrients for plants (Stamford et al., 2014). The use of organomineral biofertilizers in agriculture is rising in the world as an alternative for effective and economic fertilization. The production of biofertilizers from PK rocks supplemented with elemental sulfur inoculated with Acidithiobacillus; the oxidizing bacteria are important for recycling nutrients, and some species are important for releasing elements from rocks (Van Straaten, 2007; Stamford et al., 2008). N is one of the most important nutrients to increase plant growth and yield, and due to its role in chemical compounds such as proteins, nucleic acids and many other components, it is necessary for all kinds of life throughout the world (Berger et al., 2013). However, P and K rock biofertilizers do not contain N for use by plants and microbial organisms in the soil. Therefore, as reported by Lima et al. (2010), it is necessary to mix rock biofertilizers with earthworm compound inoculated with selected free-living diazotrophic bacteria effective at N enrichment using the process of biologic nitrogen fixation (BNF). The selected bacteria Beijerinckia indica (Stamford et al. 2017), was recently submitted for sequence analyses by a Korean group, and the new subspecies will be included in the Gen Bank after the publication of a specific paper. Nevertheless, there is a need to study and evaluate the total nutrient uptake by crops, which can be a strategy for the efficient handling of subsequent crop cycles (Sediyama et al., 2009). However, it is necessary to evaluate the nutrient uptake in different plant compartments to understand the mechanisms that affect the productivity of sugarcane in different environments (Coleti et al., 2006; Stamford et al., 2016). The goal of this study were to evaluate the effectiveness of biofertilizer produced from P and K rocks supplemented with elemental sulfur inoculated with Acidithiobacillus bacteria and mixed with earthworm compost enriched in N by inoculation with the selected diazotrophic bacteria B. indica and to evaluate the interactive effects between the biofertilizer and sugarcane mud cake addition. In addition, we tested the ability of the biofertilizer to provide nutrients to neutralize the acidity promoted by the PK rock biofertilizer and its effects on soil attributes in the presence and absence of sugarcane filter cake. The P and K rock biofertilizer was produced at the Horticultural Experimental Station of the University Federal Rural of Pernambuco (UFRPE) using two furrows (each was 10.0 m long, 1.0 m wide and 0.5 m deep). In accordance with the methodology of Stamford et al. (2008), each biofertilizer consisted of 4000 kg of natural phosphate (total P = 240.0 g kg−1) purchased from Irecê (Bahia, Brazil) and 4000 kg of potash rock (biotite; total K = 100.0 g kg−1) from Santa Luzia (Paraiba, Brazil). The sulfur oxidative bacteria grew in 2000-ml Erlenmeyer flasks containing 1000 mL of a specific culture medium (El-Tarabily et al., 2006); the cultures were sterilized for 30 min at 120 °C and shaken (150 rpm) for 5 days at 30 °C. The rocks were mixed with 400 kg of elemental sulfur and were then inoculated with 40 L (108 UFC mL-1) of Acidithiobacillus thiooxidans bacteria. To avoid the effects of excessive humidity due to rain and to increase the efficiency of the oxidative bacteria, the furrows were covered daily using black plastic. The analysis of the P and K rock biofertilizer extracted by (A) Mehlich 1 solution and (B) citric acid. This analysis were done according to Embrapa (2009), and yielded the following results: P-biofertilizer (BP) - pH = 3.8; available P (A) = 60 g kg−1; available P (B) = 48 g kg−1; K-biofertilizer (BK) - pH = 3.3; available K (A) = 10 g kg−1; available K (B) = 0.5 g kg−1 and total Cd = 1,93 mg kg-1. Biofertilizer (NPKB) was produced by mixing PK rock biofertilizers with organic biofertilizer (earthworm compound). In accordance with the methods of Lima et al. (2010), the organic matter was enriched in N by inoculation with the selected free-living bacteria B. indica (NFB 10001) by applying 40 L of bacterial culture (108 UFC mL-1). The analysis of the earthworm compound presented the following data: pH = 7.95; organic carbon = 100.7 g kg-1; total N = 8.6 g kg-1; total S = 2.98 g kg-1; and total P = 1.12 g kg-1. The rock biofertilizer (PKB) and organic biofertilizer (OB) were mixed at a proportion of 1:3 (PKB:OB), inoculated with free-living bacteria (NFB 10001) and incubated for 30 days, after which the analysis showed the following data: pH = 6.0; total N = 20 g kg-1; available P (Mehlich 1) = 15 g kg-1; and available K (Mehlich 1) = 19 g kg-1. A field experiment was conducted in a sugarcane area located in the Goiana District, Pernambuco, Brazil (07° 33’ S and 35° 00’ W; altitude 13 m). The soil used was a sandy loam soil (Ultisol) according to the USDA (2014), which is representative of a Typic Fragiudult of the Brazilian coastal tableland of the rainforest region, and had low available P and K levels. The soil analysis of samples collected in the experimental area (0-30-cm layer), based on the Embrapa (2009) methodology, presented the following results: pH (H2O 1.0:2.5) = 6.0; total N = 0.6 g kg-1; organic C = 8.7 g kg-1; available P = 4.2 mg kg-1; available K = 4.8 mg kg-1; exchangeable Ca2+ = 10.0 mmolc kg-1; and exchangeable Mg2+ = 8.8 mmolc kg-1. The physical analysis revealed a soil density of 2.65 g kg-1 and a bulk density of 1.54 g kg-1. Finally, the granulometric analysis showed the following characteristics: coarse sand, fine sand, silt, and clay concentrations of 740.0 g kg-1, 210.0 g kg-1, 10.0 g kg-1, and 40.0 g kg-1, respectively. The soil was prepared for sugarcane cultivation following the recommendations from the Santa Teresa Sugarcane Industry, i.e., cutting and removing all vegetation in the experimental area that had not been cultivated for five years by conventional tillage with one plow and two disk operations. Afterward, rows were simultaneously opened for sugarcane planting and fertilizer application. Each plot had five 10-m-long rows separated by 1.10 m, and the plants were collected from the two central rows (10 m2). Sugarcane plants were collected 15 months after plant emergence. Sugarcane yield and nutrient absorption in the upper shoots, leaves and stems were determined for 10 plants collected in each experimental area (central row) with fertilizer treatments, with and without sugarcane filter cake application. Soil analyses were conducted after harvest in consecutive years to test the effectiveness of the fertilization treatments and the interactive effects with the sugarcane filter cake in two consecutive years. The experiment was performed using a factorial scheme and set up in a split-plot design with four replicates. The fertilization treatments were biofertilizer applied at 50, 100 and 150 % of recommended rate, and soluble fertilizer applied at rate 50 % recommended rate (RR). The fertilization treatments were tested with sugarcane filter cake (40 t ha-1) and without sugarcane filter cake. The mixed NPK soluble fertilizers were produced with ammonium sulfate, simple superphosphate and potassium sulfate, which were applied following the RR for sugarcane in Pernambuco state (IPA, 2008). The application of biofertilizer was calculated based on total N content in the soluble mineral fertilizer (ammonium sulfate - 20% total N) and the total N content in the biofertilizer (2% total N). The fertilization treatments were prepared as follows: NPK soluble fertilizer (F) applied at 50% of the RR = 500 kg ha-1, 100% of the RR = 750 kg ha-1 and 150% RR = 1000 kg ha-1 as well as biofertilizer (B) applied at 50% RR = 5000 kg ha-1, 100% RR = 7500 kg ha-1 and 150% RR = 10000 kg ha-1. A control treatment of earthworm compost (20 t ha-1) was included. The statistical analysis and the analyses of variance were performed using the software SAS (SAS Institute, 2011) version 11.0. The analyses of variance and mean comparisons used the Tukey test (p ≤ 0.05). 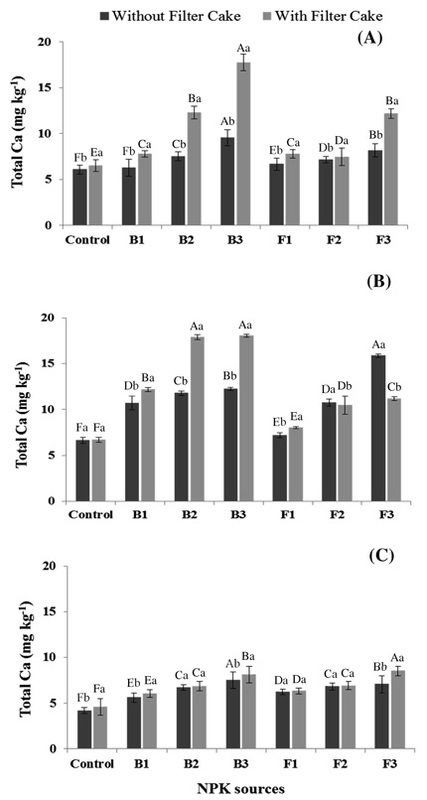 The results for N uptake in the different parts of sugarcane plants (upper shoots, leaves, and stems) with the fertilization treatments and in presence and absence of filter cake (FC) are shown in Figure 1. The data presented in Figure 1A are in agreement with the effects in plants obtained by biofertilizer applied at a rate equivalent to 100% RR in the presence of sugarcane filter cake, which increased total N content more than the application of soluble fertilizer at the same rate did. Similar results were observed for total N determined in sugarcane leaves that displayed more total N in the presence of sugarcane filter cake when comparing the biofertilizer and soluble fertilizer applied at the same rate (Figure 1B). 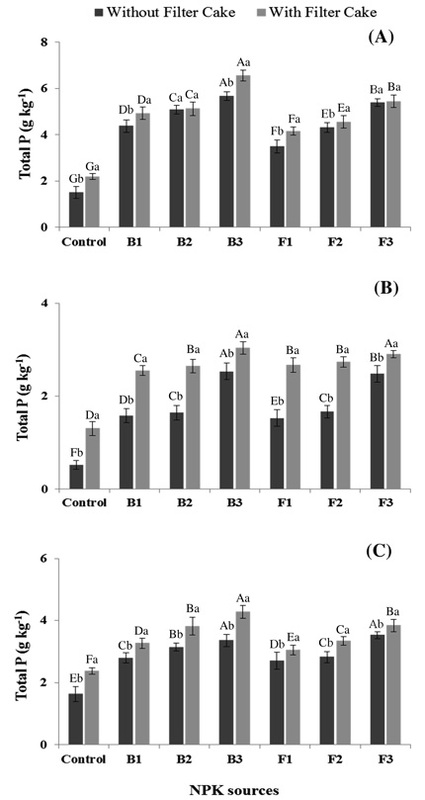 The application of the sugarcane filter cake did not present significant differences in the upper shoots between the two sources of fertilizers, especially when comparing the treatments without filter cake (Figure 1A). In reference to N uptake in the stem (Figure 1C), the results showed that higher values were observed in the treatments with filter cake application. However, better results were obtained with the soluble fertilizer source, and the same tendency was observed for nutrients analyzed in the leaves. The occurrence of increased total N in shoots and leaves probably is due to the greater solubility of nitrogen in the soluble fertilizer, which showed an increase compared with the biofertilizer (NPKB). The results of total P uptake in the upper shoots, leaves and stems of sugarcane are presented in Figure 2. It the upper shoots, biofertilizer (NPKB) showed higher results than did the soluble fertilizer treatments at the used rates, and an interactive effect between biofertilizer and filter cake application can be observed. 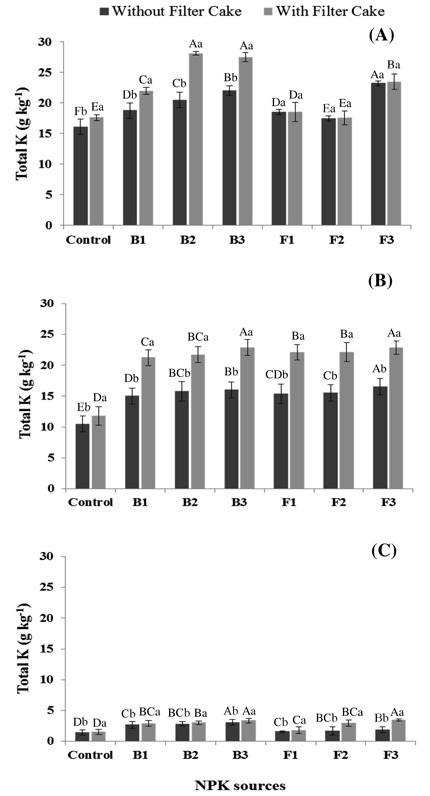 The total P in sugarcane leaves (Figure 2B) showed that the treatments with filter cake application were more expressive when comparing the biofertilizer and soluble fertilizer treatments. It can be observed that with filter cake application, better results of total P were obtained, especially when biofertilizer was applied at 150% RR; these results are not different from those with the soluble fertilizer treatment applied at the same rate. The values of total P uptake in the stem are presented in Figure 2C. When using the treatment with filter cake in conjunction with biofertilizer (NPKB), especially applied at a rate of 150%, the best results were obtained, which showed a significant response compared with using the soluble fertilizer treatments. When using filter cake and biofertilizer at higher rates, the best results were obtained. The results of total K in the upper shoots, leaves and stems of sugarcane with application of different fertilization treatments with and without filter cake are shown in Figure 3. The total K uptake in the upper shoots and leaves of sugarcane indicate the effects of biofertilizer (NPKB) compared with those of the soluble fertilizer treatment. The effects of the biofertilizer at higher rates were superior to those of the soluble fertilizer applied at the same rates regarding the upper shoots of sugarcane, and the best results were obtained when filter cake was applied (Figure 3A). However, in the treatment without filter cake, higher values of total K uptake in sugarcane were observed when biofertilizer was applied at higher rates, especially when compared with the treatment with soluble fertilizer applied at the same rates. When biofertilizer and soluble fertilizer were applied at 150% RR, there were no interactive effects with and without filter cake (Figure 3B). In the treatment without filter cake, biofertilizer applied at the recommended rate increased the total K uptake compared with the treatment with soluble fertilizer when applied at the same rate. In reference to the total K in the stems of sugarcane, the best results were obtained using the biofertilizer and soluble fertilizer treatments with filter cake application. On the other hand, biofertilizer treatment without filter cake applied at the highest rate (150% RR) showed best values of total K in sugarcane stems, but the best results were obtained when applying the filter cake treatment. The response of Ca uptake in the upper shoots, leaves and stems of sugarcane is presented in Figure 4. Higher amounts of Ca in the upper shoots were observed when biofertilizer was applied at the highest rate (150% RR), with interactive effects from filter cake treatment (Figure 4A). Regarding Ca in sugarcane leaves, the effectiveness of the biofertilizer (NPKB) can be observed, especially when applied at higher rates (100 and 150% RR), and the biofertilizer showed a marked increase compared with the soluble fertilizer treatment (Figure 4B). In the treatments without filter cake, biofertilizer applied at the recommended rate showed the best results compared with the soluble fertilizer applied at the same rate. The results indicate greater effectiveness of the biofertilizer compared with the soluble fertilizer in releasing Ca for plant growth. Biofertilizer applied at the recommended rate with and without filter cake showed similar results with respect to sugarcane stems compared with the soluble fertilizer applied at the same rate. In the treatments without filter cake, biofertilizer at a rate of 150% RR increased the Ca uptake (Figure 4C). These results were probably due to the acidity promoted by the sulfuric acid as a result of the inoculation of the oxidative bacteria A. thiooxidans used to produce the PK rock biofertilizer, which increases the liberation of nutrients contained in the rocks. In reference to the Mg uptake in sugarcane, the results are presented in Figure 5. The effectiveness of the biofertilizer showed the best results when the NPKB was applied at the recommended rate, and interactive effects with filter cake were also observed. In the leaves, treatment with filter cake showed greater effects when applied at a rate of 150% RR (Figure 5B). In sugarcane stems, the effectiveness of the biofertilizer on the Mg uptake indicated an interactive influence of filter cake application, and the results are not different compared with those from soluble fertilizer treatment (Figure 5C). A tendency for increased Mg values in the stems of sugarcane was observed when the filter cake treatment applied. The results of total N, nitrate-N and ammonium-N in soil samples with application of different fertilizer treatments with and without filter cake application collected after the second sugarcane harvest are shown in the Table 1. Table 1. Total nitrogen N-nitrate and N-ammonium in soil samples with application of biofertilizers and soluble fertilizers, in presence and absence of sugarcane filter cake (FC), after the second harvest. The biofertilizer treatment affected the total N in the soil. The total N after the second harvest displayed a substantial increase compared with the total N determined in the initial soil analysis. A similar effect was observed for the contents of nitrate-N and ammonium-N in the soil. It was also verified that the effect on N-ammonium content was superior to the effect observed on nitrate-N. Diazotrophic bacteria may be responsible for the significance in effectiveness because the biological nitrogen fixation process produces N in the form of ammonium-N, which is then incorporated into the organic compost. The results of available P and K determined in the soil analysis processed for samples collected after the second harvest are shown in Table 2. The greatest available P was higher from the biofertilizer treatment than from the soluble fertilizer treatment. It was observed a great increase in the content of available P in the soil when the filter cake treatment was applied. Table 2. Available P and K in the soil samples with application of biofertilizers and soluble fertilizers, in presence and absence of sugarcane filter cake (FC), after the second harvest. These results therefore confirm the effects of the filter cake composted with high amounts of total P and the addition of A. thiooxidans on the liberation of nutrients contained in the used rock. The effects of the NPKB were evident and influenced the nutrients in the soil. The data showed that biofertilizer in conjunction with sugarcane filter cake application and biofertilizer alone promoted the same behavior as that of the soluble fertilizer in providing available P to the soil. When sugarcane filter cake was applied, the available P in the soil promoted a marked increase that was significant and equivalent to that of the soluble fertilizer applied at the same rate. The available K in the soil in the presence and absence of sugarcane filter cake is shown in Table 2. The available K in the soil demonstrates the effect of the NPKB biofertilizer, which has a tendency to increase the amount of K in the soil when filter cake is applied. Additionally, when filter cake was applied in conjunction with NPKB at higher rates, the best values of available K in soil were observed, and were superior to those of the soluble fertilizer treatment. For N uptake in the different parts of sugarcane plants, Almeida Júnior et al. (2011) showed different results and reported a significant increase in total N in soil. However, these authors reported no effect on N uptake in sugarcane shoots. On the other hand, Oliveira et al. (2016) found positive and significant effects of organic biofertilizer on increased total N in shoots compared with those of soluble fertilizers. These authors suggest that organic matter increases N absorption and promotes significant effects on total N uptake. Borges et al. (2015) also found a higher total N concentration in the sugarcane leaves in the treatments with low application of organic matter, probably due to a concentration effect. The effects of the treatments indicated that the NPKB biofertilizer released greater amounts of N to the sugarcane plants compared with the soluble fertilizer, and these data are in agreement with those of Lima et al. (2007), who suggested the use of NPKB is viable alternative for the replacement of NPK soluble fertilizer. The results indicate a tendency to present the best results with filter cake application, and these data are in accordance with those of (Borges et al., 2015), who reported higher values of organic matter and nitrogen when filter cake was applied. Stamford et al. (2008), who found significant effects of rock biofertilizer with sulfur inoculated with Acidithiobacillus on the total P uptake in sugarcane in a greenhouse experiment. Significant effects of filter cake application on total P determined in shoots were also reported by Caione et al. (2015). In the treatments without filter cake, treatment with biofertilizer at 150% RR presented higher total P uptake than did treatment with soluble fertilizer applied at the same rate. Similar results were obtained by Stamford et al. (2006) when comparing rock biofertilizers and soluble fertilizers in sugarcane in a greenhouse study using soil from the Brazilian coastal tableland. These authors also observed effectiveness of P and K rock biofertilizer plus sulfur inoculated with the oxidative bacteria A. thiooxidans compared with soluble fertilizer application. Similar results of total P in sugarcane stems were observed when comparing biofertilizer and soluble fertilizer treatments with filter cake. The results are in accordance with those of Almeida Júnior et al. (2011), who found than an increase in total P uptake when applying filter cake promoted the best total P accumulation in sugarcane shoots of plants grown on tableland soil of the rainforest region of Pernambuco state. 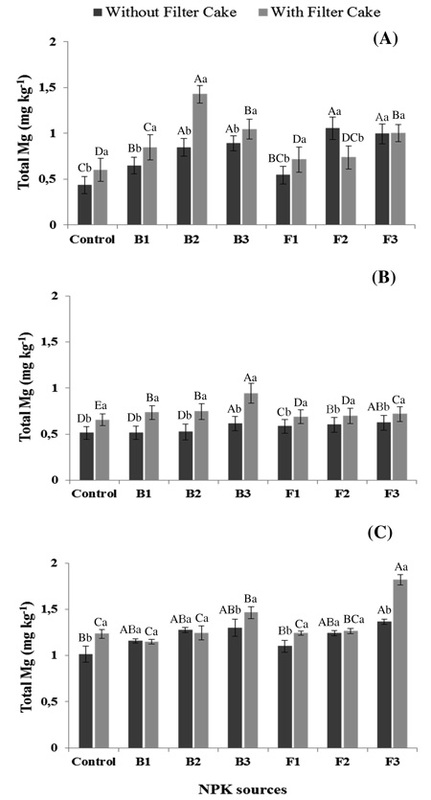 The effectiveness of biofertilizer on total K uptake compared with soluble fertilizer in sugarcane grown on a Brazilian coastal tableland soil was demonstrated by Stamford et al. (2006). Oliveira et al. (2016), studying melon grown in the Brazilian semiarid region, and Lima et al. (2007), studying lettuce in a soil of the Cariri region in two consecutive crops found similar results. Stamford et al. (2011) also reported the effectiveness of biofertilizer in grape (Vitis vinifera) grown on soil of the semiarid region in the São Francisco valley. The increases in the total K uptake also was observed by Stamford et al. (2006) in the shoots of sugarcane when testing biofertilizer and soluble fertilizer on soil of a Brazilian tableland Ultisol. The same results in total K uptake in melon shoots was reported by Oliveira et al. (2016) when P and K rock biofertilizers with sulfur inoculated with A. thiooxidans were applied compared with soluble fertilizers. Borges et al. (2015) also reported effective total K uptake in sugarcane when applying filter cake. The increase in the Ca uptake was probably due to the effect of the sulfuric acid produced by the oxidative bacteria A. thiooxidans inoculated to produce the rock biofertilizer that increased the Ca availability. This same behavior was observed by Stamford et al. (2006) studying the effectiveness of PK rock biofertilizer in sugarcane and Stamford et al. (2011) when applying the same biofertilizer. Almeida Junior et al. (2011) observed the effectiveness of biofertilizer when applying filter cake and reported greater amounts of exchangeable Ca in the soil. In reference to the Mg uptake in the leaves sugarcane, treatment with filter cake showed greater effects when applied at a rate of 150% RR. Borges et al. (2015) also reported the effects of filter cake application on Mg uptake and on other nutrients. These results are in accordance with those of Nogueira et al. (2007), who reported a positive correlation between Mg uptake in sugarcane and organic matter application. Costa and Beltrão (2010) also obtained significant increases in Mg uptake when organic matter was applied to sugarcane. An increase in the total Mg uptake in sugarcane shoots under greenhouse conditions was reported when using soil of the Brazilian coastal tableland in the rainforest region when phosphate and potassic rock biofertilizer mixed with earthworm compost was applied (Stamford et al. 2006). Similar results were obtained by Stamford et al. (2011) in grape (Vitis vinifera) plants grown on soil of the semiarid region in the São Francisco valley. Oliveira et al. 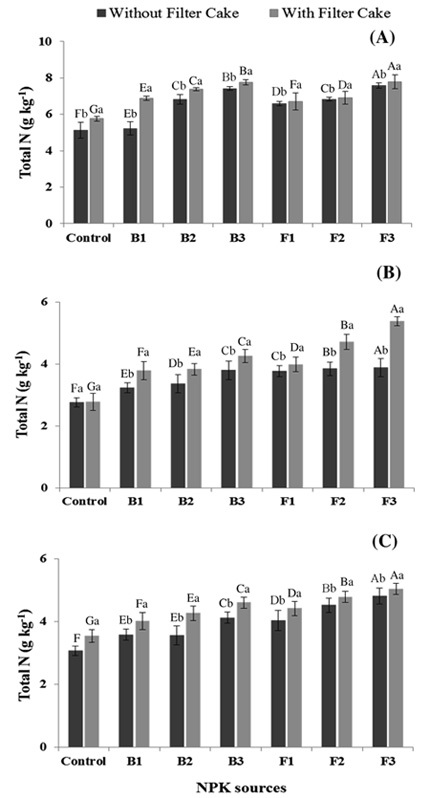 (2016) also found greater amounts of total Mg in melon shoots when P and K rock biofertilizer with sulfur inoculated with A. thiooxidans was applied compared with soluble fertilizer. The interactive effect of the biofertilizer and the sugarcane filter cake application was evident in the total N content, especially when the biofertilizer was applied at higher rates. The data are in accordance with those of Santos et al. (2011b), who reported a marked influence of sugarcane filter cake on the total N in the soil. The biofertilizer in conjunction with sugarcane filter cake application and biofertilizer alone promoted the same behavior as that of the soluble fertilizer in providing available P to the soil. These results are similar to the data obtained by Lima et al. (2007) in lettuce and suggest that the effect of the oxidative bacteria A. thiooxidans mixed with earthworm compost may be a viable alternative source of nutrient release from rock phosphate, providing available P to the soil. The use of microorganisms is important for sustainable agriculture and plant growth, as they increase the availability and absorption of nutrients, reducing dependence on chemical fertilizers that destabilize agroecosystems (Banerjee et al., 2017; Hassan et al., 2015). The obtained amounts of available K in the soil confirm the results obtained by Stamford et al. (2011) and suggest that rock biofertilizer inoculated with the oxidative bacteria A. thiooxidans may be an important process for releasing K from potassium rock, releasing nutrients in available form into the soil. Santos et al. (2011b) also reported that the application of filter cake has a great influence on and increases the available of K in the soil because this organic compound is very rich in K, and the content varies with sugarcane cultivar and the time of maturation. The results of this study indicate that the NPKB biofertilizer showed significant effects on the uptake of the nutrients by sugarcane grown on an Ultisol, and interactive effects between biofertilizer and sugarcane filter cake were observed. Biofertilizer showed great effectiveness on nutrient uptake and increased the availability of nutrients in the soil, especially total N, nitrate-N, ammonium-N, and available P and K. Thus, biofertilizers seem to be a viable alternative to soluble fertilizers and have great potential in sugarcane grown for two consecutive years. The authors are grateful to CNPq  Conselho Nacional de Desenvolvimento Científico e Tecnológico “Brazilian Scientific and Technological Development Council”, FACEPE -Fundação de Amparo à Ciência e Tecnologia do Estado de Pernambuco “Foundation for the Support of Science and Technology of the State of Pernambuco, and CAPES - Coordenação de Aperfeiçoamento de Pessoal de Nível Superior “Coordination to the Improvement of Education Personnel”, for the financial support and scholarships.